For the Feb. 23, 1974, issue, the editors invited William Peter Blatty, author of the novel The Exorcist and a producer of the film, to respond to America’s critics. This article has been republished as part of America’s special 110th anniversary issue. Several years ago I set out to write a novel that would, not only excite and entertain (sermons that put one to sleep are useless), but would also make a positive statement about God, the human condition and the relationship between the two. On its crudest level it would argue for transcendence by presenting supernatural forces as real; but on the level that would stay with the reader long after he had closed the book, the theme was something other—and deeper. At the end of The Exorcist, the mother can believe in the devil because “he keeps doing all those commercials”; but Dyer responds: “Then how do you account for all of the good?” And that is the question that my novel and film implicitly ask: namely, if the universe is clockwork and man is no more than molecular structures, how is it there is love as a God would love and that a man like Jesuit Damien Karras would deliberately give up his life for a stranger, the alien corpus of Regan MacNeil? This is surely an enigma far more puzzling and far more worth pondering than the scandalous problem of evil; this is the mystery of goodness. It is the point all critics miss. Your issue on The Exorcist was fine. Fr. Robert Boyle’s insight into the fact that both novel and film derive much of their “harrowing impact from the refusal to analyze openly” is almost astounding in its penetration to the author’s intent. Fr. Robert Lauder makes impeccable distinctions. And Moira Walsh, alas, is discerning when noting that critics of the film base their judgements on “mutually contradictory” reasons. Dominican Richard Woods, for example, attacked the film in Time because “The devil’s true work is temptation…. That is almost entirely missing from the movie. The devil in the movie was an easy devil to handle.” And the following week, Fr. Woods’ colleague at Loyola of Chicago—Maryknoll psychologist Eugene Kennedy—put down the film because “the battle between good and evil is not fought out on the level of demonology. Being a Christian...means coming to terms with our own capacity for evil, not projecting it on an outside force that possesses us.” Or tempts us, I presume. Such contradictions, when taken alone, are a source of bemusement and of wonder. But I am truly dismayed at the misconceptions held, not only by critics, but also defenders of the novel and film. And when I see that they are Jesuits, whom I thanked on the acknowledgement page of my novel for “teaching me to think,” I can only conclude that the fault must be mine, and that what I thought obvious, was not. The “fierce” opposition of America’s editor to explanations by “interested parties” has been duly noted; but perhaps his recognition of the “mystery of goodness” theme in the work has tamed him some. Perhaps just a bit. We do not ask miracles (not today). But may I clear up one or two of the misconceptions and make an occasional mild riposte? Several years ago I set out to write a novel that would, not only excite and entertain (sermons that put one to sleep are useless), but would also make a positive statement about God, the human condition and the relationship between the two. 1. The theme—the “mystery of goodness”—may fail because the ending of the novel and the film are misinterpreted (especially the film). What happens—at least as I intended it—is this: Fr. Karras invites the demon to take possession of him instead of the girl. The demon—having lost by dint of this very invitation, this act of love—accepts. Then the demon, using Fr. Karras’s body, reaches out his hand to strangle the girl. Fr. Karras fights to regain control; succeeds; and in the few moments he has available before what he knows will be the inevitable and final repossession of his body by the demon, he does the only thing he can do that will save the girl’s life (and the lives of everyone else in the house): he leaps from the window to the street below and certain death. How Fr. Richard Blake gets from this to his opinion that “the conclusion is a fatalistic belief in the penultimate triumph of the dark powers” is truly a mystery impervious to the powers of a Charlie Chan. No less mysterious to me as a Christian are Fr. Blake’s moans at the number of deaths involved in the work and his conclusion that the deaths are a triumph of evil. I, for one, have been harboring the delusion these years that “better to lose the world” than suffer the loss of one’s immortal soul. In his act of love, Fr. Karras triumphs. And I believe him to be “saved.” But then, I graduated from Georgetown in 1950. That was the “old” Church. This is the new? So, too, with Fr. Blake’s lamentation about the “total ineffectiveness of the Church and its rites.” I presume he thinks the exorcism failed. (In Scripture, and as practiced by Christ’s disciples, they sometimes did.) But missed is the fact that the “exorcist” of the title is not Fr. Merrin but Fr. 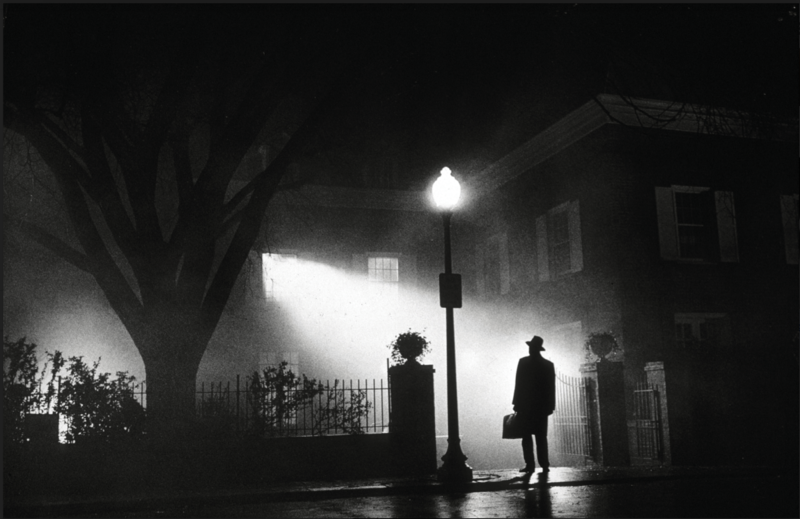 Karras; and his exorcism—through faith and love—works. So would Fr. Merrin’s have worked had he only lived. Successful applications of the ritual often take months. Fr. Merrin had an hour. 2. The possessing entity is not Satan. This is what is known in the entertainment business as a “showstopper”; and so I’ll repeat it: Satan is not the possessing entity. Rather, the entity is a demon—a devil, if you will. It is his likeness that Fr. Merrin finds on the amulet at the beginning; that he confronts amid the ruins of Nineveh; and that we see on the bed beside Regan in the course of the exorcism scene. In the book he has a name: Pazuzu, demon of the southwest wind. Nowhere in the novel or in the film are we seriously led to believe that Regan is possessed by the prince of angels, who surely has far worse things to do. True, Regan tells Fr. Karras, “And I’m the devil.” But what constrains us to believe her? Believe that and you perforce must believe everything the demon has to say, including the accusation that Fr. Merrin is a homosexual. The Roman Ritual’s instruction to exorcists has a caution against the “wiles and deceits” of evil spirits. The physical and seemingly spiritual degradation of the girl when possessed is aimed precisely at this vulnerability, stronger in Fr. Karras, but lurking in all of us. 3. Inasmuch as America’s editor commends Fr. Richard Woods for his views on possession as set forth in Catholic Mind, I return for a moment to the alleged “failure” of The Exorcist to come to grips with evil, and to the “devil as tempter” point of view. Quite aside from the fact that I believe the latter to be naive, mistaken and an excuse for evasion of confrontation with personal guilt; quite aside from the fact that I did not wish to examine this particular theme any more than I wished to examine the particular theme of Biafra in this work, instead preferring to focus on the neglected and far more positive, consoling and even joyous “mystery of goodness”; the fact of the matter is that the film deals precisely with Satan’s most potent attack on the race: the inducement of despair. It is aimed at those around the little girl, the observers of the possession, and particularly Fr. Karras, who is far more vulnerable to the attack. For Fr. Karras has rejected his own humanity: the animal side of his nature; the side that rends foods and chews and excretes; the side that kills over lust for a woman. The physical and seemingly spiritual degradation of the girl when possessed is aimed precisely at this vulnerability, stronger in Fr. Karras, but lurking in all of us (at least in the state of potency), and especially in those who, like Fr. Karras, have not lost but rather misplaced their faith because they have felt, “If there were a God, He could never love me”—or love a Regan MacNeil in the state of possession. From there to disbelief in God altogether is an easy and almost unconscious connection, but one that, at the last, Fr. Karras rejects along with despair. Thus, Fr. Blake, in my view, is mistaken when he observes that Fr. Karras “neither deepens nor loses his faith.” And when he complains that at the end of the film Chris MacNeil doesn’t seem to accept the faith as a consequence of witnessing the possession, he is looking for Disneyland, not life: for Bedknobs and Broomsticks instead of reality. When Jesus cured the blind and raised the dead, there were many who saw and yet did not believe. Faith has more to do with love than with levitating beds. And this aside, would a fictional depiction of Chris’s conversion cause a movie audience—or anyone in it—to convert? As you see, we all—myself included—have much to think about. Moira Walsh, though, is correct. In a matter of years it will all be forgotten. And yet, it has been frequently and widely reported that many viewers of the film are returning to the sacraments (originally instituted, perhaps, as armor in a very unequal struggle against “principalities and powers”?). It has also been reported that some viewers faint. Such reports were also made at the time of the first performance of the Orestes trilogy. In the case of The Exorcist, the fainting is occurring, I believe, because the viewer is making the unconscious connection between the hideous malevolence on the screen and the moral evil in his personal life; because he has recognized that the demon in all his putrescence is the ultimate father to stealing from one’s brother and calling it “business.” Perhaps the consequent return to the sacraments (factual phenomenon, whatever its cause) will be very short-lived. It probably will. Yet, finally, aren’t all of the quiddities and quibbles just so many angels on the head of a pin when compared to prompting even one soul, for even one moment, to once again be in touch with grace. This article also appeared in print, under the headline "There Is Goodness in ‘The Exorcist’," in the April 15, 2019 issue.